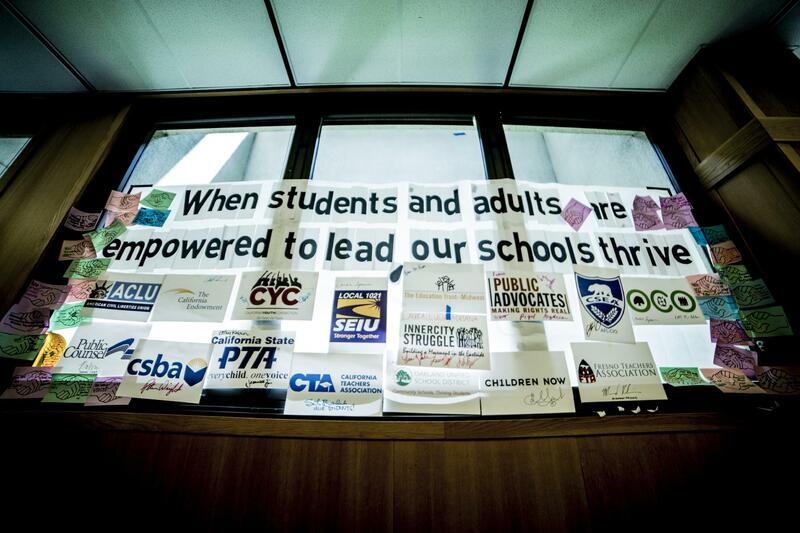 When students and adults are empowered to lead, our schools thrive. On May 16th, almost 100 students and adults representing 17 grassroots organizations, education associations, and unions filled the room for Cal Justice Talks: United Voices for Change to launch a movement where students and adults continue to flip the frame by working together to transform our schools. At the convening, students discussed the biggest barriers that stand in the way of making sure all students are valued and have the opportunity to learn and thrive in their schools. Download the infographic to the right to learn more about the issues they identified. Education leaders and organizations in the room brought their stories and expertise to the table. The conversations incited powerful ideas and solutions to the key challenges students face in our public education system. 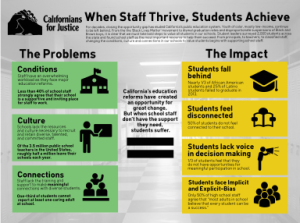 Not only are principals and teachers integral to successful and achieving schools, but support staff like counselors, teacher’s aides, restorative justice coordinators, and janitors also work in overwhelming conditions with very little support. Often times their heroic efforts to meet the needs of all students fall short. Without a doubt it is apparent that all school staff on all levels are the biggest lever to transforming our schools. We cannot continue to rely on a few extraordinary people to make up for what our education system continues to lack in systemic support for all students and school staff. What we can do is continue to unite our voices for change so that students and school staff can thrive and achieve together. Download and share our infographic and spread the word about the issues students and school staff are facing! Share with your family and friends what student leaders are working on and why it is important that students and adults lead together to transform our education system! And a special thanks to Juanita & Ingrid Roberson of Alameda County Office of Education for lending student leaders your space and support!